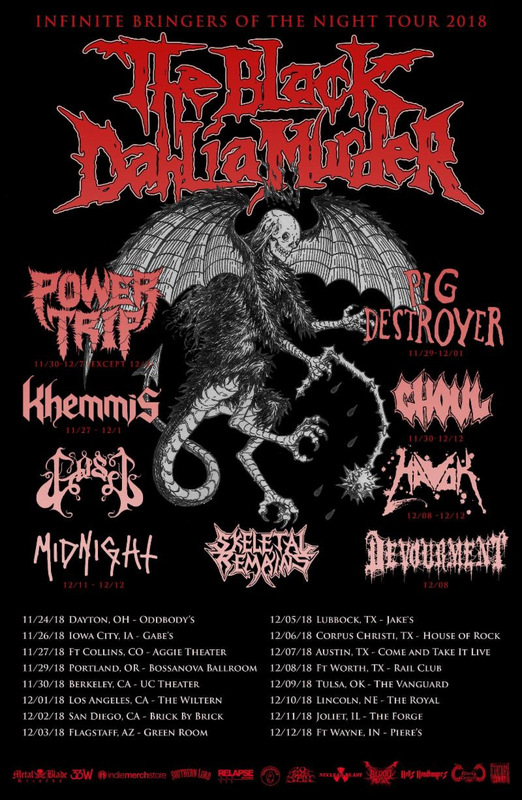 This November/December, The Black Dahlia Murder will continue its support of their internationally acclaimed Nightbringers album with a new round of tour dates. The run will include a stop at the inaugural Los Angeles version of Decibel Magazine's Metal and Beer fest. Support along the way comes from friends in Power Trip, Pig Destroyer, Ghoul, Midnight, Khemmis, Gost, Skeletal Remains, Devourment, and Havok. The Black Dahlia Murder front-man Trevor Strnad comments: "YES! The time has finally come and we are able to announce one of the coolest tours we have ever been a part of! As you can imagine, I had quite a hand in assembling the line-up here, and I am so proud and thrilled at what we've been able to construct. Not only do we in The Black Dahlia Murder get to go rage at Decibel Metal and Beer Fest in LA this winter, but we have surrounded ourselves with some INSANE regional line-ups featuring many of my favorite bands in the underground right now, to see us to California and back. Thanks to all parties involved, and be sure to check the fine print to see which of these amazingly sick outfits will be joining us in your town this November and December."